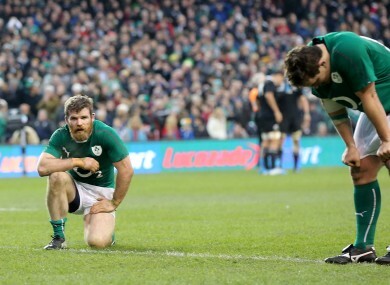 Gordon D’Arcy feel he has been on the precipice of beating New Zealand three times only to fall short. CLOSE, BUT NEVER quite close enough. Gordon D’Arcy has felt the agony of coming close to a first famous victory over New Zealand three times in his career. Yet D’Arcy’s remaining two grimaces come when he thinks back to matches well away from Dublin: the 22 – 19 defeat which came thanks to a rare Dan Carter drop-goal with the clock gone red, and a 2006 meeting which was not obviously close on the final scoreboard. It was 34 – 23 to the hosts in Hamilton, but the final 25 minutes were cruel to Eddie O’Sullivan’s Ireland. Having led 15 – 23, Luke McAllister began rifling over penalties to erase the deficit and a late Troy Flavell try removed all trace of gloss from a terrific Irish effort. “As you’re giving away that penalty (over 40 metres out), you’re probably going: ‘this is a safe place to be giving away a penalty.’ And then your man just stitches it,” a rueful D’Arcy says as he makes an unsuccessful attempt to choose a least favourite of the three ‘almosts’. From there, the former centre says, you then must go about ensuring no Kiwi is allowed a position whereby they can hit a personal high of their own – by giving them a strong hit of their own medicine. The only way to test New Zealand is to put them into a place where you are starting to question the integrity of their defence, the stress points to find a fracture or a pivot point in their defensive line. “Can you get them into a place where they are so tired or so overworked that they just look at a space and can’t get there? “That’s largely what happens when New Zealand do that to teams: they play with such tempo and the ball is gone at such a pace that it’s so draining as a defender. You just can’t get back on side and you come forward anyway and you get pinged for a penalty. The next time it happens, you just see the space and you see the defensive split. “You know you want to get together. Your defender, who’s in place, is hoping you’re going to get there. But you don’t get there and someone like Julia Savea or (Waisake) Naholo shoots through the space and that’s largely what happens. “Can we take away their kicking options? Can we beat them in the air? Can we frustrate them? Can we hone in on a couple of people? “I remember Fergus McFadden, in 2012 when we played down there, he was going over the top of Julian Savea in the air — Savea just had a shocker with the box kicks. The trouble is, this New Zealand outfit have shown precious few signs of weakness. So getting a finger into a crevice and hammering away is easier said than done. Perhaps even more so than this time last year. “You kind of hoped they would struggle after they came out of the Richie McCaw-Dan Carter shadow, but they’ve arguably got better which is annoying. “I would take a lot from what Argentina did against them. We spent the best part of a decade going down to New Zealand. You try to beat them by playing at them. If you sit back and defend, you’ll get absolutely steam-rolled. What do Ireland need to do to beat the All Blacks? Email “'We have to be perfect': Attack the only way to keep All Blacks off balance”. Feedback on “'We have to be perfect': Attack the only way to keep All Blacks off balance”.